70 Christmas presents. 7 countries. Over CHF 1500 raised. We are proud of the combined efforts put in by both students and staff from every house on campus, all led by the boys and Belvedere Assistant Houseparent, Miss Harold. . .
As the holiday season approaches, Belvedere has been working hard organising the creation of gift boxes to be sent to children in need in Moldova, Ukraine, Romania, Belarus, Serbia, Bulgaria and Albania as part of the “Action Paquets de Noel” initiative which occurs every year throughout Switzerland! Last weekend, students dropped in to Belvedere to join us packing boxes for these children. 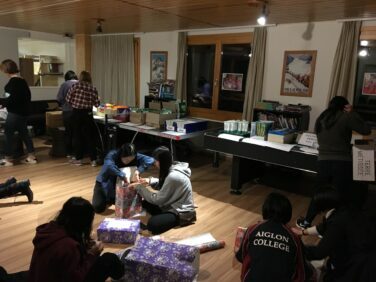 The gifts include small luxuries that many of us take for granted such as: pens, pencils, paper, colouring pencils, toothbrushes, toothpaste, soap, sweets, toys, socks, gloves and of course some Swiss chocolate too! Once packed, we all proceeded to wrap up our boxes and even listened to festive music creating a wonderful atmosphere. With Thanksgiving approaching, and our annual Thanksgiving dinner taking place this Sunday, our gift boxes allowed everyone to reflect on what they are thankful for and in turn, make a difference in someone’s life. We are proud to say that in the finest traditions of Belvedere House, and with the help of many Aiglon students, we will be sending 70 boxes to children and families living beneath the poverty line in Eastern Europe. We hope our small contribution will help these children and their families over the coming year.